Economics for the masses. This is how I classify this book. Freaknomics made this genre famous, and introduced millions into the everyday Economics. Having said that, this is not a book on Economics. Don Ariely, the author, has this unique style of writing which makes one feel that he knows him for years. This is like a friend talking to me about my own irrational behavior. A psychologist might scoff at this book, writing it off as another take by a behavior economist into people’s behavior and predicting that by testing decision making empirically. The basic assumption that Humans behave rationally is questioned by the Psychologists and this is the base premise of this book. One important takeaway from the book is the importance of Money, or rather the lack of it, in influencing people’s behavior. It is re-iterated by multiple examples that Money is the most expensive way to incentivize and social norms and society pressure acts as a better incentive. The basic thing we grapple with on a daily basis – Actual vs. Perceived value. One other important message derived in this book is the fact that most of us are somewhere deep within a little dishonest. We would not dare steal money openly from others, but when there is a layer in the middle, it lowers our inhibition. Yes, that guilt free extra tea bag in a hotel room does count as dishonesty, if it is not your normal behavior. All corporate frauds and white collar financial hara-kiri is seen from this lens and does offer a convincing insight on why people commit the fraud. 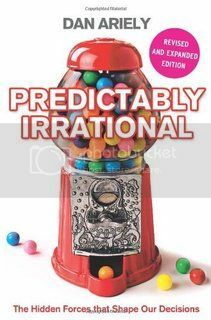 This book makes us realize all the irrational decisions that we have been making on a daily basis. So, now you know why you fall for the extra 5% off on a book on amazon.in, in spite of knowing that you probably do not want to read and will probably never read that book ever again!